• For use with 18 and 30 pound cable ties to provide stability when securing bundles. 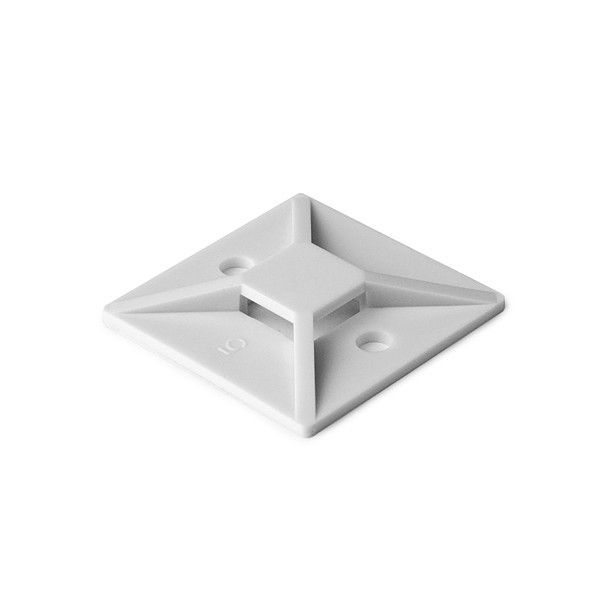 • Secures with rubber based adhesive backing and/or two or four screws. • 4 way opening allows cable ties to be installed parallel or perpendicular to wire bundles. • For use with 18 and 30 pound cable ties to provide stability when securing bundles. • Secures with rubber based adhesive backing and/or two or four screws. • 4 way opening allows cable ties to be installed parallel or perpendicular to wire bundles. HellermannTyton adhesive fastened mounting bases are used with 18 through 150 pound cable ties to provide stability when securing bundles. The mounts are installed using the adhesive backing and/or by securing two or four screws. The 4 way opening allows the cable ties to be inserted parallel or perpendicular to the wire bundles.